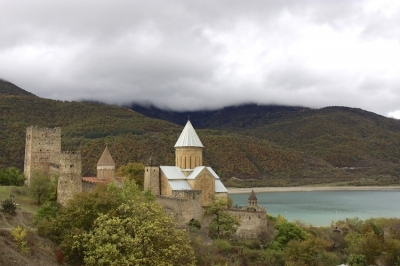 Ananuri is part of the Tentative list of Georgia in order to qualify for inclusion in the World Heritage List. 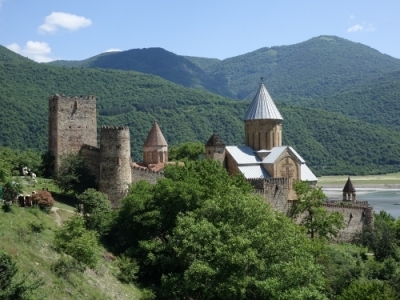 The 17th century fortress of Ananuri is part of the Tentative List of Georgia. It was the castle and seat of the Dukes of Aragvi, a feudal dynasty which ruled the area from the 13th century. It lies some 70km north of the capital Tbilisi, along the Military Highway that leads up to Vladikavkaz in Russia. On the first day of my trip to Georgia I visited Ananuri as part of a full day tour along that 213km long historical road. When we left Tbilisi we got caught in a small traffic jam, all because of scores of tourists wanting to go up that same way. Tourism is really booming in Georgia since a few years: people come mainly from the neighbouring countries such as Azerbaijan and Russia, but also from India and the Gulf States (or perhaps they are Indians who work in the Gulf). After an hour’s drive the fortress of Ananuri comes into sight. Seen from the bridge by which you approach it, it is really picture-perfect. The fortified complex consists of a typical Georgian Orthodox church with a cone-shaped dome, surrounded by crenellated walls. There are a few other towers as well, including one with a stepped pyramidal roof of Svanetian type, and a smaller church. These spires and domes are all adding to the spectacle. To be able to enter the fortress we first have to go through the tourist market in the parking lot, where they sell stuff that we are about to encounter along the road all day: mainly knitted socks, sheep wool caps and honey. The courtyard of the fort is almost completely filled by the large church. Later on this trip I will probably get enough of it, but on this first day I am still enthusiastic about entering a Georgian Orthodox church. As a female you have to wear a long skirt and a headscarf, which garments can be borrowed at the entrance. The church consists of only one space and is quite sober except for a number of 17th century murals including a Last Judgement. We also climb the highest tower of the fort. The fortress was the scene of numerous battles, and this square one was the last tower to hold out against the enemies. It is a hot day and the stairs are steep, which finally makes me decide to skip the planned hike later in the day to the Gergeti monastery which would involve 7km of climbing. Ananuri is well worth visiting as a stop on your journey up the Georgian Military Highway. This is still the most important route between Georgia and Russia: it has the only border crossing between the two countries that is still open today. There’s a lot of traffic from trucks, and also roaming cows are a frequently recurring obstacle. It took us 5 hours from Tbilisi to end at the last major town on the Georgian side, Stepantsminda. From there we visited another splendidly located monument, the Gergeti monastery. The Ananuri fortified ensemble is conviniently located on the very touristic Georgian Military Highway some 70km north of Tbilisi. The view on the fort from the highway is phenomenal, with the (artifical) Zhinvali lake as a backdrop. Ananuri is a very popular toursit attraction, and the parking lot is full of souvernir stands. Entrance is free, and once inside the walls, there is no commercial activity anymore, and we can concertrate on visiting those historic buildings. This fort was the headquarters of local feudal dynasty, controlling the valley, and the scene of several battles. Within the walls of this fort are two 17th century churches, the smaller Saviour’s church and the more imposing Church of the Virgin. Both display nice relief carvings on their exterior walls. On the west end of the walls is a 5 stories square tower (Sheupovari), built in the 12 the century, very worth climbing for a good view of the complex. In between the two churches is another 12 century watchtower. Ananuri is a nice and atmospheric place to visit, and a convenient stop on the Georgian military highway. Must see! I visited Ananuri fortress while travelling on the Georgian Military Highway. It's a very nice and beautiful place! There are many tourists who come here in cars and huge buses and groups. That's why in the season you should be prepared to stand in a small queue to the best spots for photos. Under the fortress there is a small beach, you can swim in the reservoir.